The internet, morning talk shows and food magazines are all a buzz right now with what food you should be serving at your super bowl gathering. From Buffalo style EVERYTHING, to pizza, 7-Layer Dip, and chili. 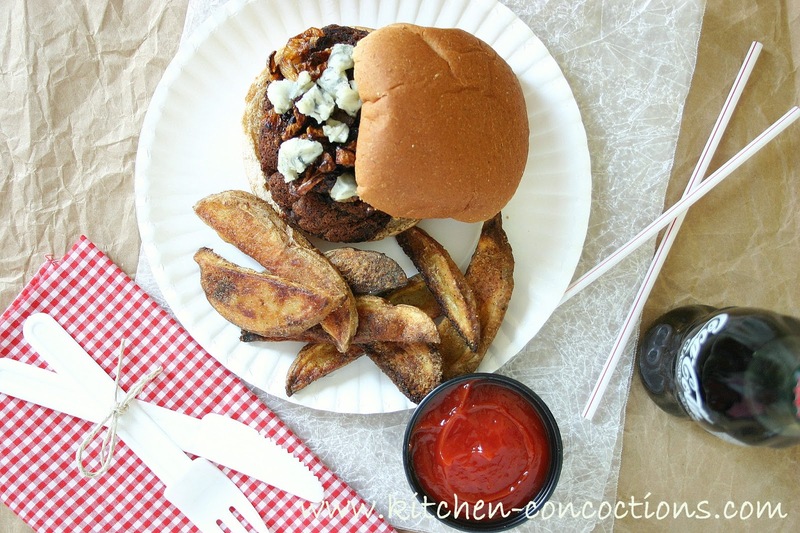 But for me, and many others, burgers are essential to the tailgating fun! All the guys (and gals!!) gathered around the grill talking smack about each other’s team, drinking a brewski and waiting impatiently for the big game to begin! Since I firmly believe that some sort of burger should grace your Super Bowl game day spread, I have one to share with you today. I am going to get a lot of flak for proposing a ‘vegetarian’ burger as the burger you should be serving at such a ‘macho’ event like the Super Bowl, but I have mentioned it before, many all of my friends eat special diets, quite a few being vegetarian. So for a football watching party at my house, these would totally be an option! 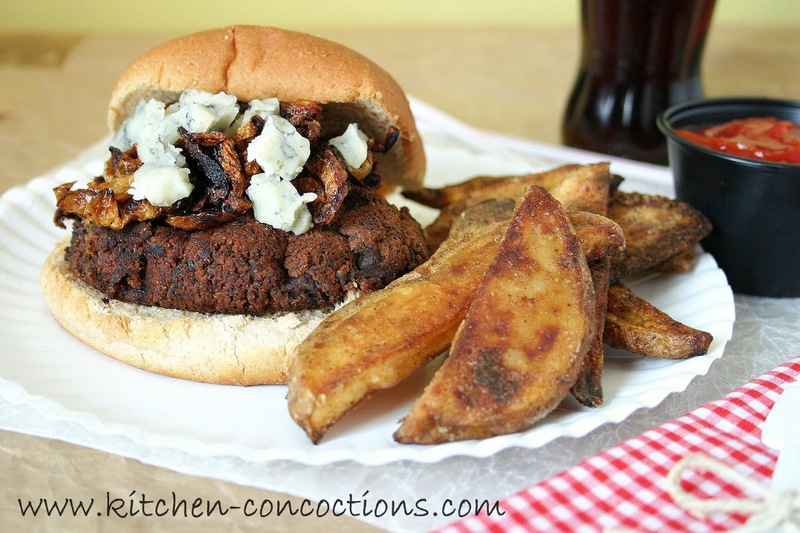 A black bean burger with a slightly smokey and earthy flavor, topped with robust blue cheese and sweet caramelized onions; even the manliest of men will enjoy this black bean burger! Combine the mushrooms, salt, black pepper, garlic, barbecue sauce, Worcestershire sauce, black beans, bread crumbs and parsley in a food processor. Pulse until ground but not completely smooth. Form black bean mixture into six patties and place on a baking sheet lined with parchment paper. Cover and refrigerate until firm, about 45-60 minutes. Meanwhile, heat 1 tablespoon each butter and olive oil in a large skillet over medium heat. Add the sliced onions and a splash of water. Sauté onions until deep caramel in color, about 15-20 minutes, stirring occasionally. Set aside. After burger patties have chilled, heat the remaining 1 tablespoon each butter and olive oil in a large nonstick skillet over medium heat. Working in batches, cook the patties until golden brown, about 6 minutes per side, using caution when flipping. Meanwhile, toast buns, if desired. 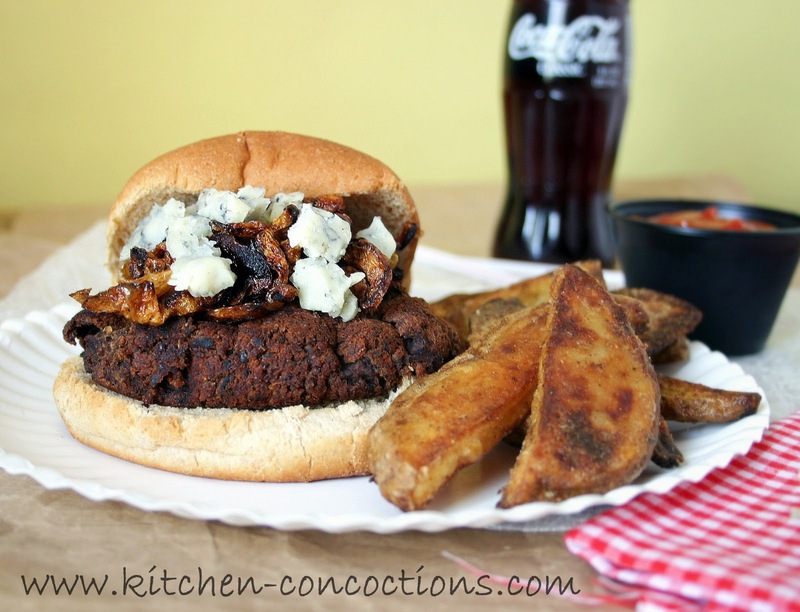 Serve the cooked black bean patties on the buns; topped with additional barbecue sauce, blue cheese and caramelized onions. Well, I love it, of course! I think the blue cheese is a perfect addition.